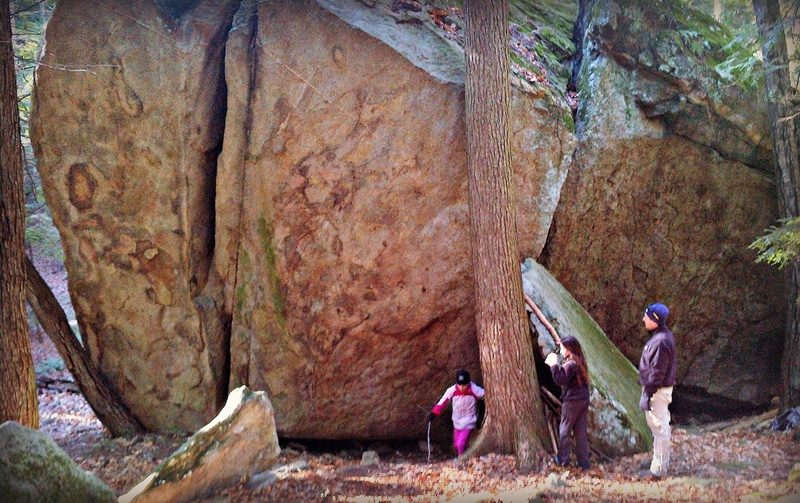 Exploring a overhanging rock along the boulder trail in Pawtuckaway State Park. Well, not lost, I don’t think. But they certainly are doing a very fine job of hiding among the enormous and amazing boulder field in Pawtuckaway State Park in Nottingham. Neither Janelle nor I have ever been to this part of the park, and we are instantly mesmerized. 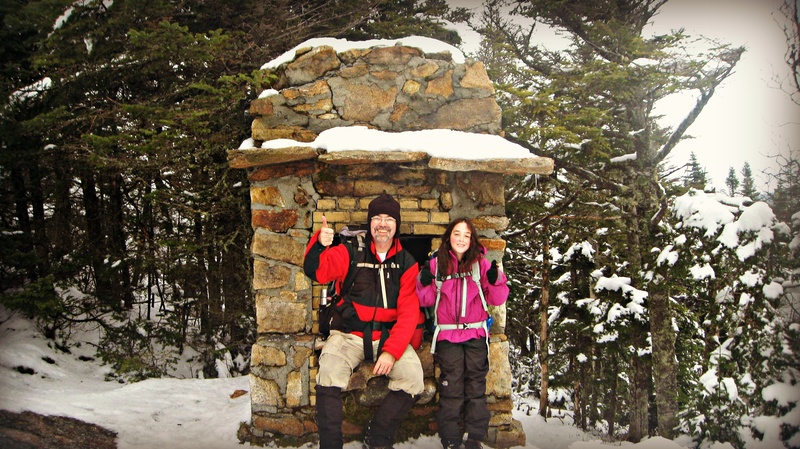 We’ve come for a day hike with our close friends Ralph and his daughter Alayna. The two girls met only once before, at our grand book release party, and formed an instant connection. We’ve been trying to get back together ever since. To Janelle, Alayna is the kid her age who climbed Mt. Katahdin, who hiked over Knife Edge. “I don’t think I could do that,” Tough Cookie has said on more than one occasion about Alayna’s feat; a statement tinged, I believe, with a mix of fear and hopefulness. She talks about Katahdin in Maine in the same tones she uses for Mt. Washington, as if to say, that sounds terrifying, but if you think I can do it, I’ll give it a shot. Someday, we will. 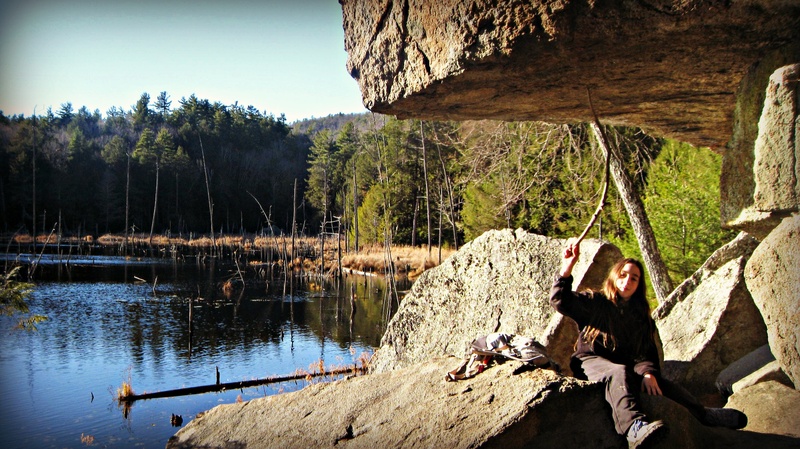 But for now, the weather is mellow, the forest is open and dry and we are surrounded by the most amazing boulders and caves. We had initially planned on doing a loop through the boulder field, then up and over North Peak and back to the car. But once we stepped up onto that first boulder and scanned the incredible field ahead, all four of us understood pretty quickly that we’d spend the rest of the day here. How could I never have come here before? 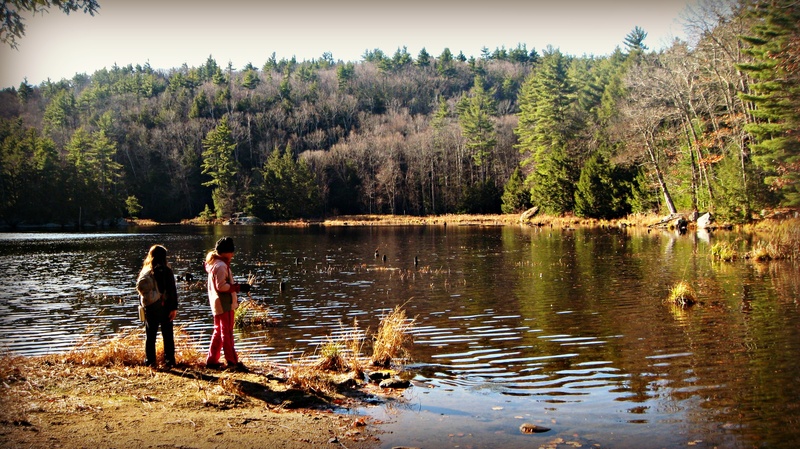 Janelle and Alayna explore Round Pond. With the undergrowth down and sight lines through the field excellent, the girls decide to play a game of hide and seek. They would hide, we would find them. Turns out, they are very good at hiding, and we are very bad at finding. Ralph and I spread out to try to box them in, but they are fast and every time we get close they scamper away like field mice. At one point, they disappear altogether after scurrying down the ridge and literally disappear. Ralph and I split up to look for them, and I feel a small twinge of concern. But I can’t imagine getting lost here where the boulders rise up everywhere. It would be very difficult to get turned around. And it’s Janelle, right? I taught her to keep the ridgelines in sight, to find waymarks, to understand terrain. 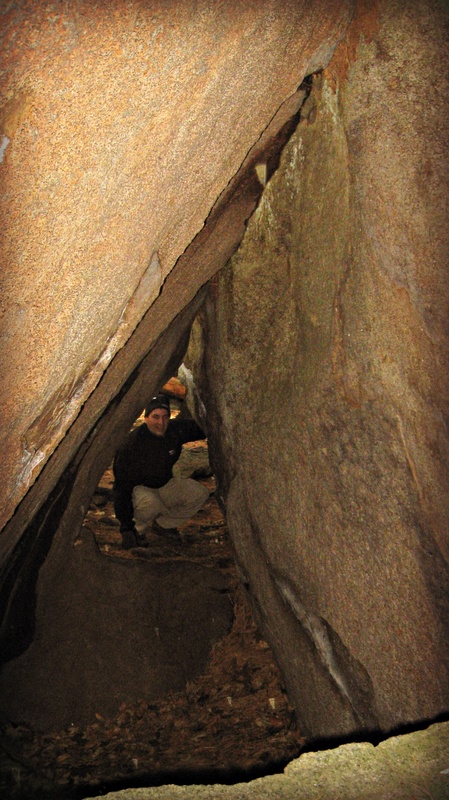 I wind my way back down toward the boulder cave where we initially set up our camp and where we’ll have lunch. I have a hunch they doubled back. Along the way I pass a dozen rock climbers working on various routes in the field. Big boulders everywhere. The girls show Ralph a cave route. And as I come around a turn, I see their little heads peeking up from behind a table boulder, just feet from our backpacks. They are both hugging the rocks, trying to keep out of site. Grinning madly. And I think to myself that maybe being here works just fine. That maybe, as grand as a Presidential ridgeline can be, that today, here, among the rocks and caves, memories made will be just as indelible. 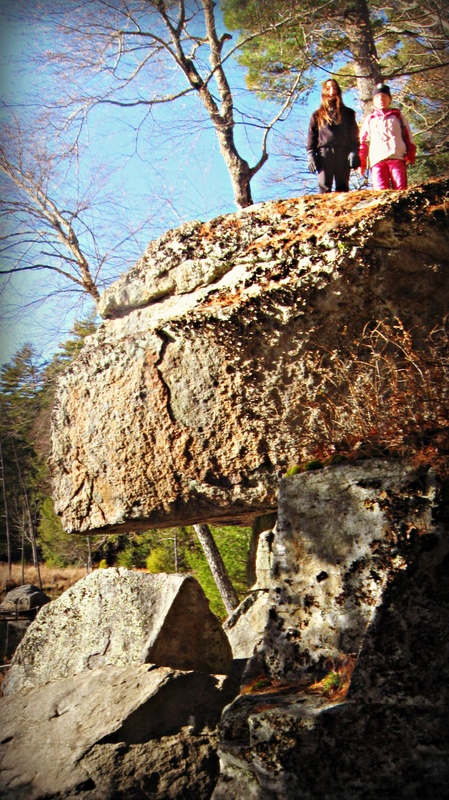 Little Pawtuckaway will give us that on this cold fall day; two little girls climbing on rocks in the woods. “I found them, Ralph,” I shout, and the girls laugh and disappear behind the granite and the chase is on once again. The girls get a good view. Ralph checks out a cave. Shout out Thursday: Our publisher is coming, our publisher is coming! Everyone look busy! Turns out our publisher is on tour as well! 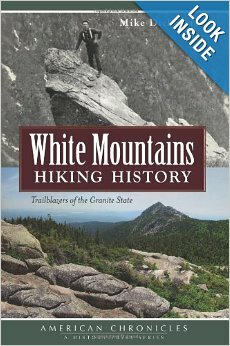 Mike Dickerman, the mountain man behind Bondcliff Books, will be in Concord Monday, Nov. 25 at 7 p.m. for a slide show and presentation at Gibson’s Bookstore. 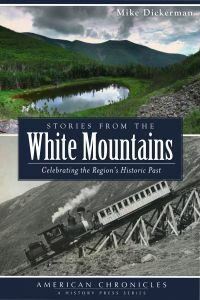 Mike has two new books out, Hiking History of the White Mountains and Stories from the White Mountains. Mike will be there at 7 p.m. with a slide show and signing. Janelle and I will be on hand as well. So, if you’re a fan of our adventures, you’re going to love Mike. See you there! Oh, and it’s FREE! Oh the places we’ll go, Bristol tonight for example! We’ve had such a blast visiting libraries across New England, and we’ll stop by another one tonight. 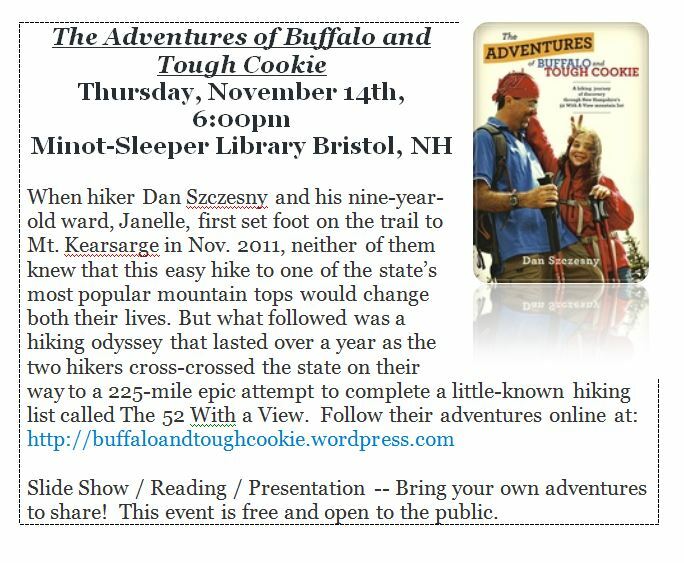 Join us at the Minot-Sleeper Library in Bristol, NH for an evening of trail talk and adventure. They just had a remodel and expansion at the library and it is just a beautiful place to hang out, meet people and speak of mountains! And speaking of libraries, I wanted to acknowledge the work of the good folks at Goffstown Library who created a Book Trailer Video for The Adventures of Buffalo and Tough Cookie. I like to think they did this for no other reason than because Sandy and Jessica and the whole crew over there are amazing. Thank you! We enjoy a sunset from near the top of South Unc. 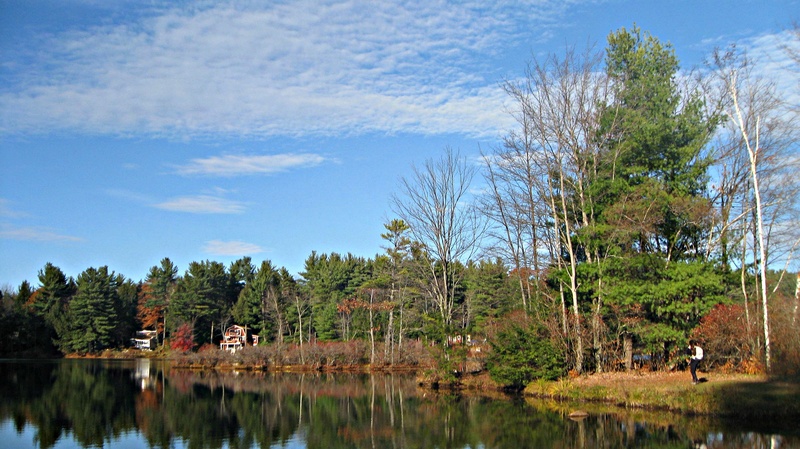 The girl and I make our way around the western flank of South Uncanoonuc in Goffstown. The leaves are so thick, they come up to her calves in some spots. Winter is nearly here and this will likely be our last hike of the season without having to deal with the white stuff. Today is also Election Day; the third one in a row that we’ve hiked on. Last year, we fought hard to make our way up the Horn in a snowstorm. Two years ago, we began our 52’er journey with a hike up Mt. Kearsarge. Today, the day is mellow and I feel melancholy. We had bigger plans for the day, but life got in the way and we settled on a quick hike to one of our favorite places. North Unc was the first mountain we climbed together. This will be the first time we climb South Unc together and we picked a longer trail than the straight up old tram route. I wanted to have a little more time with my partner, a few more tenths of a mile on the trail and she seems fine with the extra miles. We pass a make-shift lean-to and the girl crawls into it. “We could camp here!” she says. Near the top, there’s a side path simply labelled “view.” We follow, a soon we come to a magnificent open ledge that looks west. From here we can see three mountains we have already climbed: Pack Monadnock, Monadnock and Kearsarge. Someone has dragged two plastic lawn chairs up here, and suddenly we no longer have any interest in the summit. Janelle drags the chairs out into the open and sets up the auto-shoot on my camera. “Go sit there,” she says, directing our impromptu photo shoot. She fiddles with the camera, finding the right rock for balance, then scrambles to the chair next to me. One picture. One try. The pic you see above. The sun begins to set into our eyes and the girl and I relax and sip tea and talk about the mountains like we are old friends. She considers this for a moment, then lifts her hand toward me. “Pinky swear,” she says. And there on old plastic chairs facing the sun, high above the ground, the girl and I wrap pinkies and make a promise neither of us has any clue if we’ll be able to keep. Exploring the South Unc pond before our hike up. Our one year anniversary since finishing the 52! 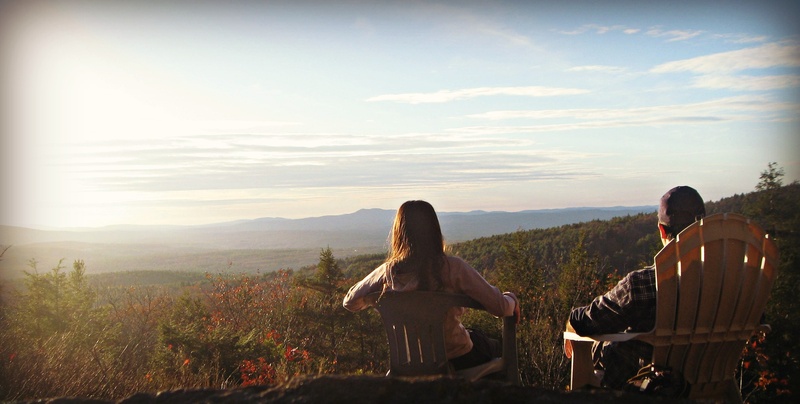 One year ago today, Janelle and Dan finished their journey of the 52 With a View. On our one year anniversary, we wanted to say thanks to all our our family, friends and supporters who have made this past year so amazing. Thank you and keep hiking!